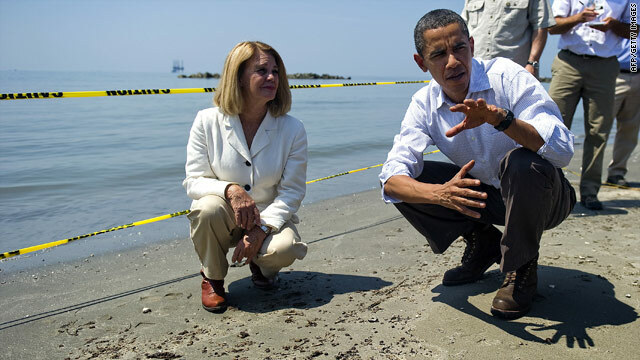 President Obama pauses during a beach tour with Lafourche Parish President Charlotte Randolph on Friday. Obama vows to put federal muscle behind cleanup, says there are alternatives to "top kill"
Obama: "I ultimately take responsibility"
Grand Isle, Louisiana (CNN) -- President Obama returned from a tour of the oil-stricken Gulf Coast on Friday and vowed to do all he could to help area residents and businesses clean up the mess and recover financially. "We want to stop the leak, we want to contain and clean up the oil, and we want to help the people in this region return to their lives and livelihoods as soon as possible," the president told reporters. Flanked by more than a dozen Gulf-area politicians and officials, the president -- the sleeves of his shirt rolled up -- called the oil spill that began April 20 and continues today "an assault on our shores, on our people, on the regional economy and on communities like this one. "This isn't just a mess that we have got to mop up. People are watching their livelihoods wash up on the beach." Obama said he had heard "heartbreaking stories" from Grand Isle Mayor David Camardelle of fishermen who are trying to figure out where their next paycheck will come from. "This is something that has to be dealt with immediately," he said. "This is our highest priority, and it deserves a response that is equal to the task. That is why this has already been the largest cleanup effort in U.S. history." Video: Critics: Who's in charge of oil cleanup? More than 20,000 people are working in the region to clean up the spill, including 1,400 National Guard troops activated in four states, he said. So far, more than 3 million feet of boom have been deployed, he said, adding that he will ensure that the lead federal official responding to the spill, Coast Guard Admiral Thad Allen, gets "whatever he needs to deal with this crisis." Obama said it would be "welcome news" if BP's "top kill" effort succeeds in stopping the runaway flow from the well a mile below the surface of the water, but he said that that other efforts are under way, too. "A team of some of the world's top scientists, engineers and experts -- led by our energy secretary and Nobel Prize-winning physicist Steven Chu -- has for some time been exploring any and all reasonable contingency plans," he said. Obama said he has directed Allen and Homeland Security Secretary Janet Napolitano to triple the manpower in places where oil has hit shore or appears within a day of doing so. Information about resources available to area residents and businesses will be posted at whitehouse.gov, he said. In addition, doctors and scientists will be stationed in the affected states to monitor the potential impact of the spill on the health of residents, an expense that BP will pay, he said. "BP is the responsible party for this disaster," he said. "But as I said yesterday and as I repeated in the meeting we just left, I ultimately take responsibility for solving this crisis. I'm the president, and the buck stops with me." He added that federal authorities are prepared "to do whatever it takes for as long as it takes to stop this catastrophe, to defend our natural resources, to repair the damage and to keep this region on its feet." In a response to some local officials, who have been calling for a berm to be created to keep the water from getting into fragile marshlands, Obama said Allen is prepared to authorize moving forward with "a portion of the idea." And he called on Americans to help, too, by visiting the region. Except for three beaches in Louisiana, all of the Gulf beaches are open, safe and clean, he said. But it was to the long-term residents that he targeted his message: "I'm here to tell you that you are not alone," he said. "You will not be abandoned, and you will not be left behind." Though about 25 percent of the Gulf of Mexico exclusive economic zone has been shut, most federal waters in the Gulf are open to commercial and recreational fishing, according to the National Oceanic and Atmospheric Administration.